Just a few days till Halloween and I wanted to share with you one build I’ve been preoccupied with since spring. I hoped to create the rolling hills of a French countryside wine region similar to Provence using Apple Fall’s rural farmhouse (rare) from the The Arcade March 2015 round. Nestled in the hillside, the stucco two-story building with creeping ivy, clay tile roof, worn exterior shutters and double barn door has a vintage aged working farm atmosphere. Step outside to be greeted by vineyards, zig-zag rose-bush lined cobblestone path and a secret retreat garden shed. The converted garage barrel room has some of the best views of the lake and hillside. Come join me on my journey, a step back into time. The interior of the farmhouse is vintage shabby chic with a distinctive feminine feel with rose print chairs and rugs in the living room. The first floor has an open layout concept with the dining area near the stairwell and the kitchen on the back wall, with views of the sunflower field out the kitchen window. Enticing baskets of fruit and baked goods are arranged on the pantry unit just in reach from the dining table. The opening under the stairwell has bushels of fresh picked farm apples. Although small, the kitchen has everything one needs with a vintage stove, butcher block counter tops, farmhouse sink and country stove. As we move upstairs we are awash in royal blue and cream. Two doll houses grace the window facing the rolling hillside, a cozy chair placed next to the dresser with an antique French perfume print which hangs above. The inviting bed beckons us with a breakfast tray already made, the dressing area has a corresponding armoire with hat boxes placed on top and a rose detailed ladder for easy access. Hope you enjoy the trip back in time! Wishing you a very belated harvest greetings! Sorry, real life kidnapped me again. In some ways I feel like Second Life is my mistress (or the male version in my case), I love the creative minds, the ability to design and the freedom to explore new ideas but it’s becoming difficult to carve out a few hours each week. I’m going to finish up my outstanding projects and take an extended break. But before I get ahead of myself, I want to share with you my version of autumn glamping. The crisp air, the crunchy fall leaves and glorious harvest moon is beckoning us outdoor and the ideal backdrop to showcase some new releases from Sway’s, Serenity Styles and The Mustard Seed. Ms. Lavinia Godenot, creator and owner of The Mustard Seed is offering a fresh takes on fall decor, on sale until Thursday, October 1, 2015 (all under $150L). The new offerings include Happy Autumn Welcome Sign with pumpkins, leaves and Indian corn (group gift), Autumn Apple Cider Patio Set (texture change chairs) with hot cider, sweet treats, woodland bird umbrella chair and apple basket, Autumn Haybale with sleeping kitty (harvest sign & potted plants), Barrel of Fun Corn with multiple animations and Autumnal Fireplace (2 size, small & large) great for indoors or out. I also used TMS Sunflower Trio and Gentle Overhang Tree (texture change). To complete the decoration of the pavilion, I used Serenity Style Country Swing, Birdhouse Fence wall decor, Autumn Wood Blacks & Babe Doll (offered at Tres Chic till 10/5), My Fall Set cabinet with bowl and floral frame (available @ The Fantasy Collective until 10/15). I also styled the gazebo with What Next Harvest Garland, Wreath, texture change Welcome Sign and Pumpkin Bucket. Finally, Sway’s has everything you will need to enjoy a night under the stars starting with the Birch Gazebo (new release for The Mix, ending 9/30), Camp Out Tents & Oil Lamps available at The Arcade (ending 9/30), Walden Cuddle Log with texture change blanket (2 versions) and Walden Campfire Set including log/tree stump with pillow, camp kettle/mug, and marshmallow/sausage on sticks. Hope you enjoyed my take on glamping and are inspired to redecorate your home with these great deals. Have you heard about the 24 Event? 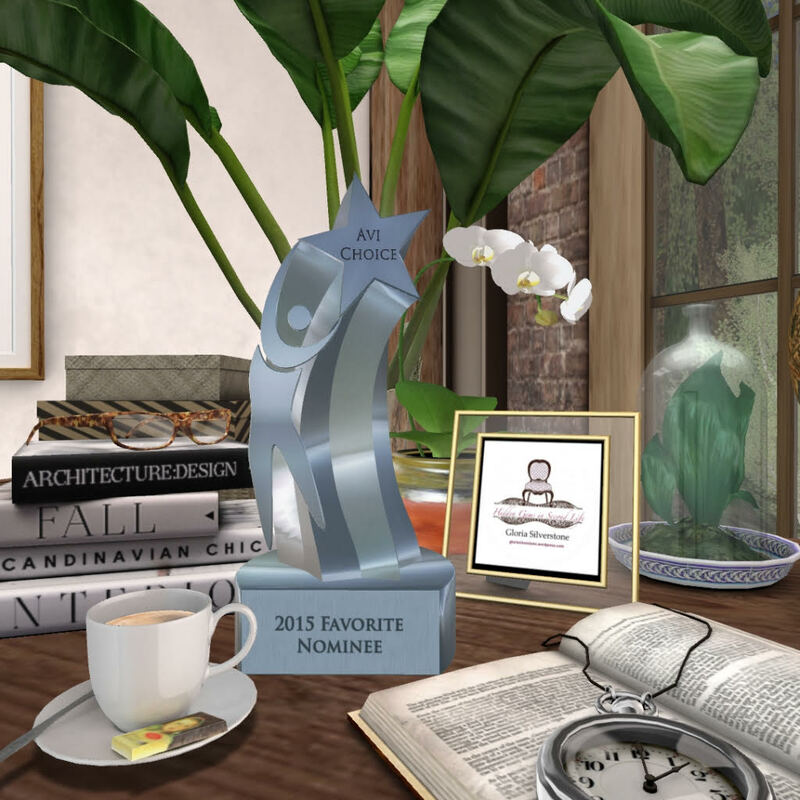 24 2015 is an annual event that brings together the top Second Life designers in fashion (male & female) and home decor (70 total) for one week (September 11-19, 2015). Each store offers an exclusive limited quantity item only available at the event. Also included in the collection (not shown) an additional empty white coffee tray and animated faux snow window. The Ashford Living Room collection is a classic and perfect for your SL entertainment needs. I can see holiday decor blending nicely with this grouping. Run over to the 24 Event by September 19th to get the collection before it’s gone forever! DeAnn Dufaux of Park Place Home Decor, also designed corresponding items in the Ashford collection: walnut bookcase, desk and beige desk chair (back wall) available at her main store, on sale this weekend (all under $100L). The Ashford Walnut Bookcase is filled with books, storage, frames, files and decorative items. The matching Ashford Walnut Desk, with open and close drawers, is the ideal spot to relax or work. The desk includes reference books and beige table lamp. Who wouldn’t want to get down to business in the cozy and oversized upholstered beige Ashford Desk Chair? Also on sale this weekend for $60L is the Copper Plate Table Centerpiece. To bring the outside in, I used Park Place Birch Tree Picture wall art over the Ashford Desk. The black frame and leaf outline enhances the black classic lines in the Ashford Living Room collection. You can find the Birch Tree art at the 24 event! Lastly, Little Branch Potted Bilbo Birch Tree is a free group gift and can be found at the Cosmo Shopping Region. Hope you’re inspired by the classic with a contemporary twist living room, so Let’s Get Decorating! Today, I have tons of new releases from Serenity Style; combine them all together to make the perfect autumn bedroom. First up is the Always Kiss Me Goodnight Set available at On9 Event until September 28, 2015. The Goodnight Set includes a natural wood animated bed and matching nightstand. Also offered at On9 is a green painted version of the bed. To the left of the bed is the Dizzie Set (room divider, wheel, and mannequin) found at Mesh Avenue, till September 30, 2015. Every time I style a room featuring Serenity Style items, I include a board game or toy to showcase Hans Inshan (owner & designer) whimsical and unique style. This time I used the Game Time Checker Set, soon to be available at Flux Sur Mer event on September 15th. To complete the bedroom, I used The Ancient Ladder wall art, the suitcase table desk (part of the Travel Summer Set), and Divine Flash Camera (on the suitcase desk). Hope to see you on the grid! Autumn is quickly approaching, the leaves are turning a golden shade, the air is crisp and the smell of yummy delights waft through the house. I love fall and it’s my favorite time of the year to decorate. The season makes your home and landscaping look so inviting. Dreamscapes Art Gallery has released a number of new autumnal decor items perfect for your landscaping needs. I styled the Tumbleweed One tiny house by Dorian, a cute one-room log cabin trailer with loft space and bathroom (7 x 20m, 21 prims). I loved the painted red door with engraved deer outline, I thought it would be the perfect backdrop to showcase Dreamscapes new items. First up, is Dreamscapes Art Gallery new VIP Group Gift Autumn Haybale Deco with Candles and Apples for Sale sign. I flanked the new group gift with What Next Orchard Decor Set (ladder, basket and fallen apple decor). Behind the haybale is The Mustard Seed Sunflower Trio with Frog and Bee, available for 50% off at Perfect Ten (until 9/15/15). Finally, Dreamscapes Topiary Pumpkins with Lights welcome guests and border the porch steps. On the porch I styled two separate entertainment areas; to the left of the front door I used the Dreamscapes Vintage Pallet Set, which includes a bar table, three bar stools with different fabric cushions and a tray of Halloween cookies. I accessorized with Dreamscapes Apples Wood Buckets, Autumn Deco Shutter E and La Galleria Sunflowers in Pumpkin decor. The right side of the porch, I used another Dreamscapes Autumn Haybale Deco B with lantern, plaid blanket seat and pumpkin decor including a carved pumpkin, Autumn Deco Shutter B and Pumpkin Bucket D. Dreamscapes has a number of haybales and decorative shutters, so be sure to check out all the versions. In the foreground of the trailer house are some more adorable Dreamscape harvest landscape items consisting of Autumn Deco Tree Stump with carved pumpkins, Candle Chair Autumn, and Market Cart B with Apples and Pumpkin Bucket B. I also used What Next new VIP Group Gift Scarecrow with texture change fall greeting sign. The Mustard Seed Gentle Overhang Tree & Autumn Days Climbing Vine/Trellis (both texture change & on sale) are placed in the back right corner of the landscaping. On the market cart is The Mustard Seed Honey for Sale Set with sign and vintage beehive honey pot, on sale for 50% off at Perfect Ten event. I hope you enjoyed my autumn hideaway and are inspired to create a warm and inviting landscaping using Dreamscapes Art Gallery items. Lastly, I want to mention Dreamscapes Art Gallery parcel has undergone a renovation and expanded with two large stores, multiple buildings, landscaping spaces, and a larger art gallery area. Carlotta Ceawlin, owner and designer of Dreamscapes is generously opening her art gallery to guest artists for free. Check out the rules below and follow-up with Carlotta (she’s really nice :-). With the renovation of my parcel I’ve decided to offer space for guest artists at my gallery, which I did in the past and always wanted to happen again. There will be no costs for invited artists to display, but there are some requirements. Dreamscapes Art Gallery is an established location since years and shows on the top page under art/gallery in SL search. I’m looking for high quality SL artwork only (no RL paintings, photos, etc). The artwork must be your own and free of any copyright issues, which will be checked by me (no exceptions to this rule!). Artwork must be PG, tasteful, non violent and again, high quality only! Each guest artist gets his space for three weeks and can change displayed work as often as wanted – there’s no rule to do so though. But you may want to show off a new work, then feel free. So how do you get invited? Send me a notecard with your name and link to your work (flickr, etc), or inworld location to look at. I’ll consider having you as guest artist and let you know! PS: Space is limited and the selection of artists is totally subjective by me. If you don’t get invited doesn’t mean your work isn’t good or high quality, maybe it just doesn’t *speak to me. Don’t be sad and don’t be mad 🙂 Art is often a matter of personal taste.